I am looking for a restoration boat from between 1955-1957. Let me know if you have something for sale! I received the registration for the boats. I was wrong on both. The HiLiner is a 57 and the Grady White is a 60. I have a 1959 HiLiner 16ft speedstar with trailer and a 1964 Grady White 17ft Hatteras Model both have trailers. I am in NE Pennsylvania about 15min from the Jersey line. Hey John, I have 1956 Chris Craft Sportsman. Complete boat running engine, hull needs restore, trailer. https://youtu.be/NPWn429bfYg HI check out this boat it is not old but looks in the correct era you are looking for. Im looking for 40' to 60' sailboat with or with out rigging or a power boat. Im looking for a free boat. I've been living on a cal T/4 for the last 4 yrs. Any help in finding a boat would be greatly apappreciated. Hi there, would like to receive a free boat in and around London with no problems with mooring. Please send photo and information about it too. Need the sailing rig, daggerboard, sail, rudder and tiller for this dinghy. 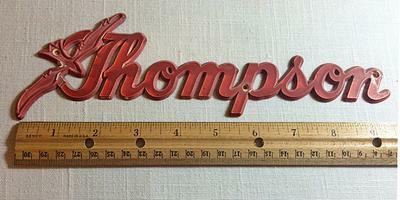 I am looking for a plastic "Thompson" nameplate/logo for the side of my 1956 Thompson Sea Coaster. It is red in color and is made of plastic. I have two aluminum name plates that look exactly like the one you've posted. The gulls? looks like they were red at one point, but all that's left is a little red along the edges. They are solid, in excellent shape, only slightly pitted and would shine nicely with a little steel wool. I'm not exactly sure how this works, so not sure if I leave contact information or not. I will check back to see if you've left a comment I guess and go from there. If you have the picture or the original Greg take it to a three DE printer cheep and fast. 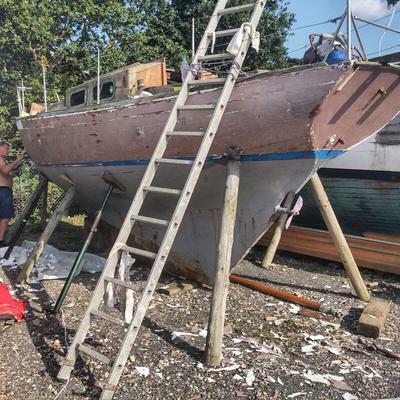 Wooden Mast and rudder needed for Alan Buchanan 25ft yacht. Restoration. I'm currently restoring an Alan Buchanan 25ft yacht, a smaller version of the East Anglian. Its currently without a rudder or mast. I'm on the look out for both. If you think you can help don't hesitate to get in contact. The boat is in Hayling Island Portsmouth area UK. Happy to collect. Pay. Comments for Wooden Mast and rudder needed for Alan Buchanan 25ft yacht. Restoration. Hello, what length of mast do you need? I have a 22 foot 6in Hamper 3.5 T wooden sloop in similar condition to your boat that I have a mast and rudder for. If I dont dispose of the yacht by next Friday, may be available.